The fabric hasn’t been ironed yet as I haven’t managed to get out to purchase some iron cleaner. My iron currently has some copper glitter stuck to the sole plate from our art group meeting. I can’t wait to see how the pieces look after they’ve been ironed. These colors capture the look of my Pee Gee hydrangea flowers at the end of the blooming season perfectly. Sunday, I attended my second NY Bead Guild meeting, and decided to join in on all the fun. The women are really friendly, and very knowledgeable. The project this month was a Wavy Wave Necklace, and I started and stopped it 4 times before I was happy with it. First I didn’t add the little block of 4 seed beads between the waves. I actually liked the look with only 1 seed bead between the waves, but I restarted the necklace, and made it according to the directions – because I really wanted to be able to correctly follow a bead pattern. I did not like how it was looking with those extra seed beads, so restarted it for the third time. Back to my original 1 seed bead in between the waves. As I was merrily stringing my beads, I realized I would not have enough crystals to make the necklace as long as desired. 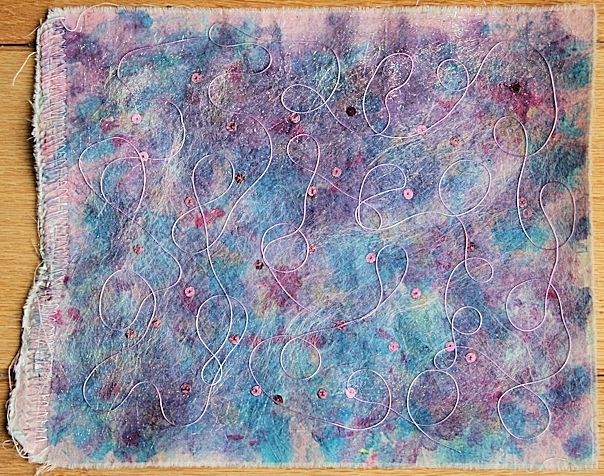 The waves were too closely spaced, and I also didn’t like the color of the seed beads I was using. I changed the color of the seed beads, went back to the original directions putting 4 seed beads between the waves, and am very happy with how it’s progressing. If you double click on the photos, they will enlarge for you so you can see the details better. The black nylon bag I used for the background will soon be replaced by a piece of black velvet. It should result in better photos. I haven’t posted in awhile as there has been a lot going on in my life. We went to Arizona for our vacation, and 2 days into it, my mother-in-law passed away. We headed to PA for the funeral and drove 4,800 in 10 days – 4 days to get to Arizona, 2 days of vacation, then 4 days of driving to get to PA. After the funeral, we didn’t have it in our hearts to go back to Arizona, so drove another 250 miles back home. We stay in an RV resort that is a mix of permanent trailers and people like us who drive to Arizona and stay in our RVs. 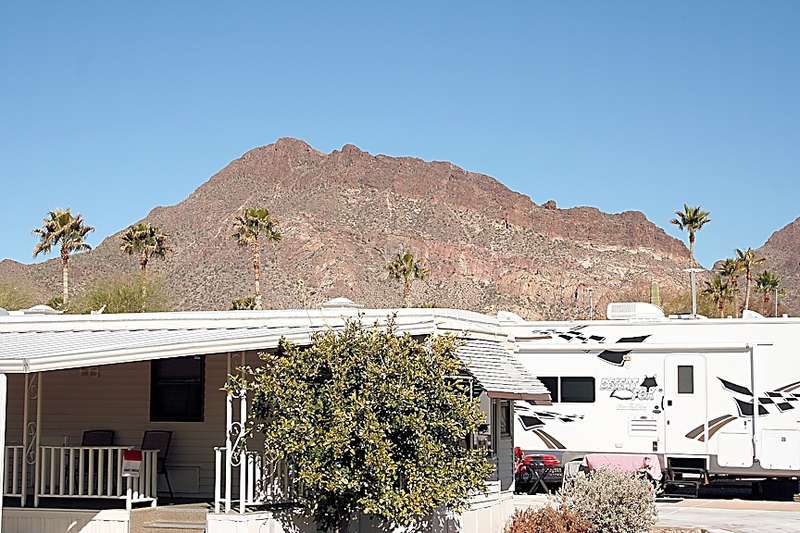 I love seeing those mountains in the background with the palm trees in our RV resort in the forefront. There is civilization on the right side, and desert on our left side – a perfect combination as far as I’m concerned. We wake up to bird song every morning, can see the sun climbing into the sky, plus have lots of friendly neighbors, a gorgeous pool, hot tub, and there is even a quilt group which meets in one of the buildings on site. 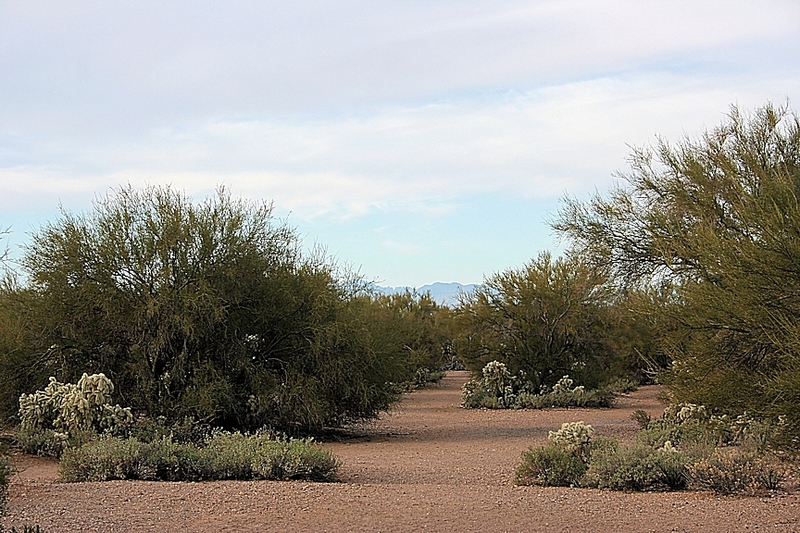 I miss the warmth and walking in the desert, but am getting lots done now that I’m home. Our monthly art group meeting met at my house yesterday and we had a grand time. We were having so much fun, I totally forgot to take pictures of what everyone was making, so you’ll have to make do with my pieces. I mixed 5% DOS in 4 colors for everyone to use, but used Pro Chem Navy 414 and Dharma 300 New Black for this piece. 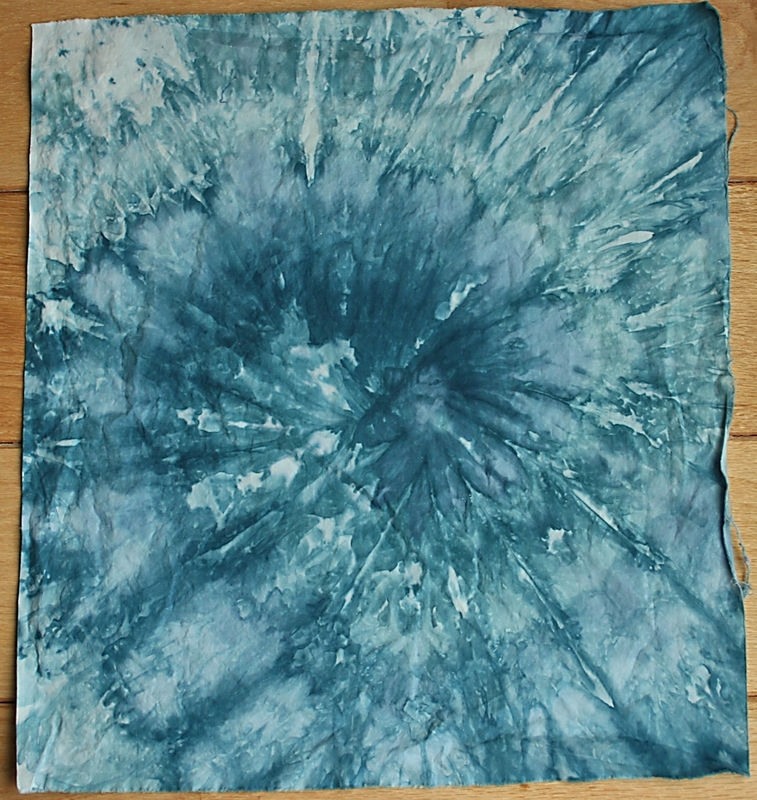 The fabric was twisted and the black dye was put in the center, with the navy all around it. I am pleased with this design and plan on making a few more pieces this weekend. We took a cookie break – my husband picked up some cookies for us from Gruttadauria’s Bakery – my all time favorite bakery, and I finally learned how to use my husband’s Keurig coffee maker. It’s a royal PITA as far as I’m concerned. When you have a group of people who want coffee, life is a lot easier if you have a 12 cup coffee pot. I do like it for individual cups, but not for entertaining. 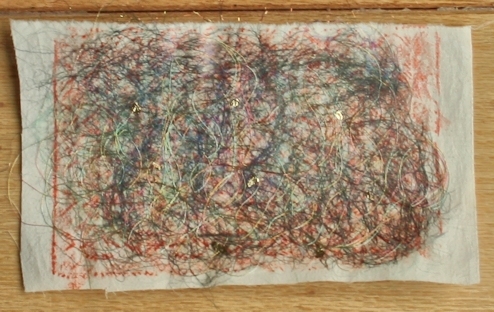 A couple of different colors of Angelina, lots of unwound metallic variegated YLI thread, and little bit of gold leaf was bonded to this piece. Sue had brought some BoNash, decorative yarns, and Angelina for us to try, Karen had the gold leaf and some glitter, and I had a bagful of Angelina fibers, sequins, parchment paper, teflon sheets and iron. It’s really nice when you have a group of people who share their supplies with each other. It enables us all to try new ideas without having to run out and purchase everything ourselves. 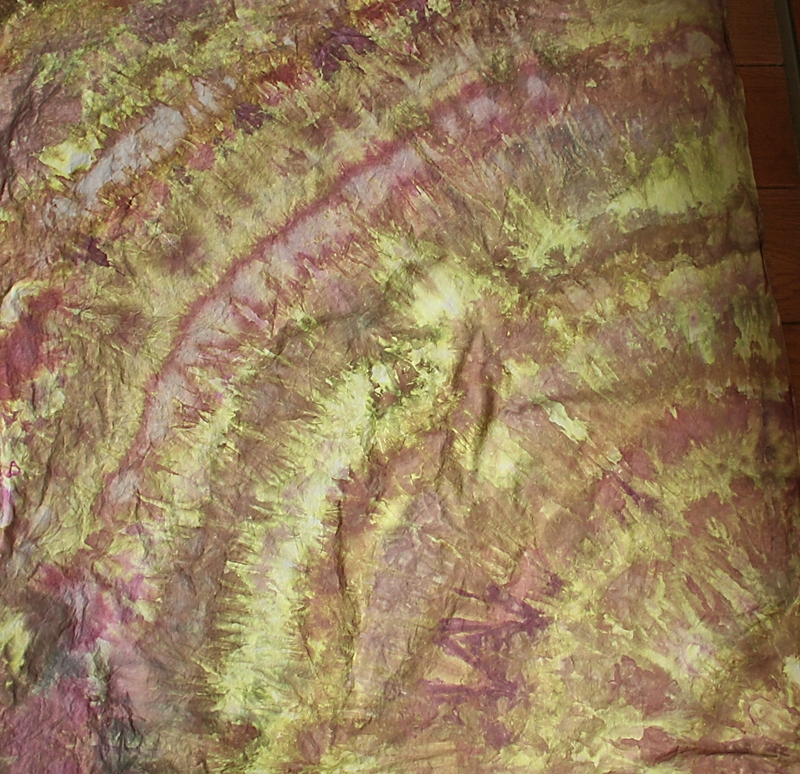 I added sequins, Angelina fiber, and some Sulky variegated thread to this piece. This one made me very happy. 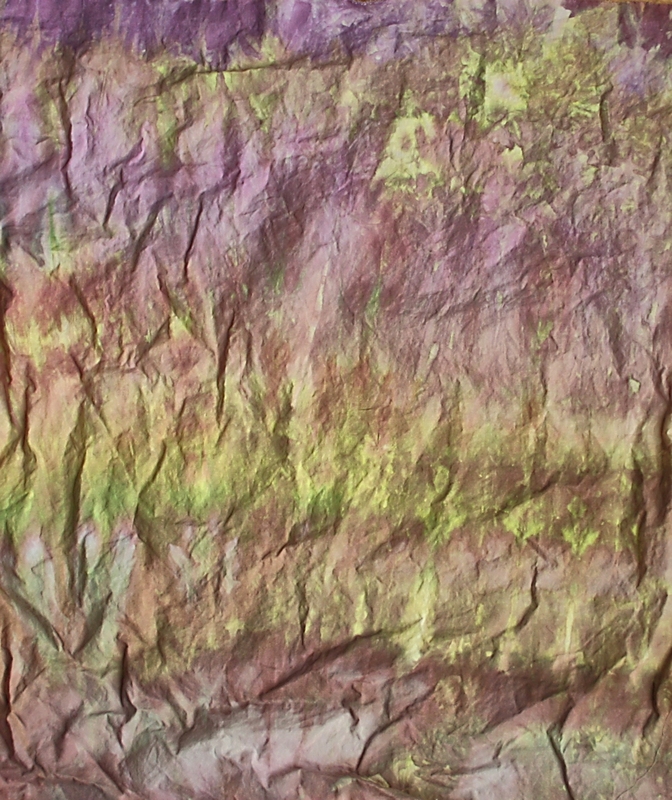 Sue made some ethereal looking fabric from multiple layers of Angelina. It looked stunning against a white background. I can’t wait to see what she does with it. Julie used some yarn and glitter on her pieces and they looked really good. Karen used lots of glitter on her pieces. Lucy was our cheerleader for this meeting, and color advisor. She didn’t feel like making anything yesterday, but we all would have missed her terribly if she hadn’t been part of our fun group. Now to decide what to make with these new fiber pieces.